Etihad Airways, the national carrier of the United Arab Emirates, has recently launched their “Inspired Service,” a personalized flying experience in their First and Business class. With this new service, passengers can specify when they want to eat and what they want to eat based on the airline’s ala carte menu. Etihad will have chefs onboard, so passengers can expect fresh meals even at 30,000 feet. The onboard dining experience in the premium cabins is overseen by Etihad food and beverage managers. “Etihad’s new F&B managers have a background in the hospitality industry, mostly from five-star dining establishments. Their extensive knowledge of menu composition, presentation and quality will ensure that our onboard dining experience meets the highest standards,” says Juan Torres, Etihad Philippines Country Manager. During the launch, we were invited to try their onboard menu for all classes. Airline food has always been a source for much dismay and criticism, but I doubt Etihad would get those with their new menu. The food was great, even in economy. 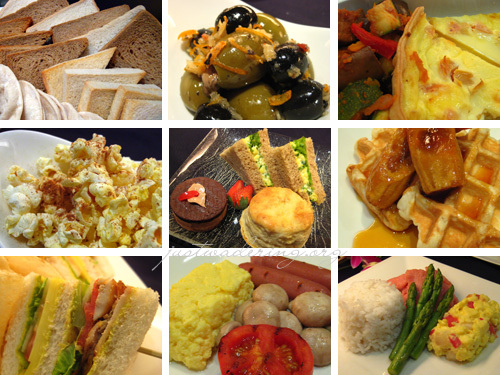 The onboard menu features European and Arabic dishes. For flights originating in Manila, you can expect to see local products like pan de sal being served. WOW, look at all that food. I hope the food in the economy class wasn’t TOO much of a difference.